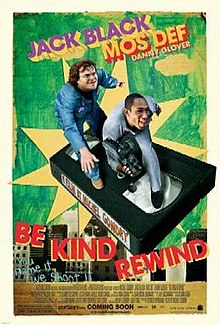 Be Kind Rewind is a 2008 comedy film written and directed by Michel Gondry, and starring Jack Black, Mos Def, Melonie Diaz, Danny Glover, Mia Farrow and Sigourney Weaver. The film first appeared on January 20, 2008 at the 2008 Sundance Film Festival. It was later shown at the Berlin International Film Festival. The film opened on February 22, 2008 in the United Kingdom and in North America. The title is inspired by a phrase that was commonly displayed on VHS rental cassettes in America during the medium's heyday. In Passaic, New Jersey, the declining "Be Kind Rewind" VHS rental store owned by Mr. Elroy Fletcher (Danny Glover) is due to be demolished to make way for high-end development (due in large part to the refusal of Mr. Fletcher to rent out DVDs) unless he can find the money to renovate his building, despite his claims that jazz pianist Fats Waller was born in that building. Mr. Fletcher leaves on a trip for several days to join friends and memorialize Waller, as well as visiting a DVD rental store to learn efficient and modernized ways of running a video rental store, leaving his only employee, Mike (Mos Def), to tend to the store. Before leaving Mr. Fletcher cautions Mike to keep his paranoid and klutzy friend, Jerry (Jack Black), away from the store. After attempting to sabotage a nearby electrical substation, believing its energy to be melting his brain, Jerry becomes magnetized, and when he enters the store the next day, he inadvertently erases all the VHS tapes in the store (as well as making the camera go out of focus, whenever he walks past it). Mike quickly discovers the disaster, and is further pressed when Miss Falewicz (Mia Farrow), Mr. Fletcher's friend, wants to rent Ghostbusters. To prevent her from reporting a problem to Mr. Fletcher, Mike comes up with an idea: as Miss Falewicz has never seen the movie, he proposes to recreate the film using himself and Jerry as the actors and cheap special effects hoping to fool her. They complete the movie just in time when another customer asks for Rush Hour 2. Mike and Jerry repeat their filming, enlisting the help of Alma (Melonie Diaz), a local woman, for some of the parts. Word of mouth spreads through Miss Falewicz's nephew (Chandler Parker) of the inadvertently hilarious results of Mike and Jerry's filming, and soon the store is seeing more requests for such movies. Mike, Jerry, and Alma quickly pass off the movies as being "sweded", insisting the films came from Sweden and thus able to demand long wait times and higher costs for the rental. Soon, to meet demand, Mike and Jerry enlist the locals to help out in making the movies, using them as starring roles in their films. When Mr. Fletcher returns, intent on converting the store to a DVD rental outlet, he quickly recognizes that they are making more money from the sweded films than from normal rentals, and joins in with the process. However, the success is put to a halt when two court bailiffs (Sigourney Weaver and Paul Dinello) arrive, insisting the sweded films are copyright violations, and seize the tapes and the store's assets, crushing the tapes with a steamroller. Without any money to renovate the building, Mr. Fletcher gives up hope, and is forced to reveal to Mike that he made up the connection of Fats Waller to their building. Mr. Fletcher is given a week to evacuate the building before it will be razed. Jerry, with the help of the local townspeople, convinces Mr. Fletcher and Mike to give one last hurrah and put together a documentary dedicated to the fake life of Fats Waller, and the two quickly warm up to the idea. On the day the building is scheduled for demolition, Mr. Fletcher invites all the locals to watch the final film. In his eagerness to start the show due to the presence of the demolition crew waiting to start the job, Jerry accidentally breaks the store's only television, but a nearby DVD store owner loans them his video projector, allowing them to show the movie on a white cloth placed in the store's window. As their film ends, Mr. Fletcher, Mike and Jerry exit the store to find a crowd has gathered in the street to watch the film through the window, including the city official and wrecking crew, and they are given a rousing applause by the gathered crowd. Films that were erased and recreated are referred to as having been sweded. These remakes are unedited with only a single take per scene. The tapes are described as having come from Sweden as an excuse for higher rental fees and longer wait times. Jerry fabricated the word "sweded" while arguing with Craig (Chandler Parker) and his gang. In light of the theme of sweding, director Michel Gondry sweded a version of the trailer of the film, starring himself. On the official website, users can engage in sweding, which puts their faces on the VHS cover of a movie. The Be Kind Rewind YouTube channel also encourages filmmakers to create sweded versions of popular movies. The theme of sweding also relates to film history, in that the collectively made remakes represent social memories of films, and memories that arise through films. The film has received mostly positive reviews, with review aggregator Rotten Tomatoes reporting that 65% of critics gave the film positive reviews, based on 128 reviews, with an average rating of 6.3/10. The site's critical consensus reads, "Slighter and less disciplined than Gondry's previous mind-benders." Metacritic reported the film had an average score of 52 out of 100, based on 35 reviews. Writing in The New York Times, reviewer A. O. Scott called the film "inviting, undemanding and altogether wonderful" and added that "you'll want to see it again, or at least Swede it yourself." In its opening weekend, the film earned $4 million in 808 theaters in the United States and Canada, ranking No. 9 at the box office, and averaging $5,013 per theater. As of September 21, 2008, the film had grossed $30.4 million worldwide—an estimated $11 million in the United States and Canada and $19 million in other territories. ^ "BE KIND REWIND (12)". British Board of Film Classification. Retrieved March 5, 2014. ^ "Be Kind Rewind (BFI)". British Film Institute. Retrieved May 2, 2014. ^ "Be Kind, Rewind (2008)". Box Office Mojo. May 1, 2008. Retrieved January 15, 2014. ^ "Be Kind Rewind - Movie Reviews, Trailers, Pictures - Rotten Tomatoes". Rotten Tomatoes. Archived from the original on February 24, 2008. Retrieved February 22, 2008. ^ "Be Kind Rewind (2008): Reviews". Metacritic. Archived from the original on February 18, 2008. Retrieved February 22, 2008. ^ "Be Kind, Rewind (2008) - Weekend Box Office Results". Box Office Mojo. Retrieved May 28, 2008. ^ "Be Kind, Rewind (2008)". Box Office Mojo. Retrieved May 28, 2008. Wikimedia Commons has media related to Be Kind Rewind.